I'm not really sure how to describe Spinacles without making a really bad pun to do with getting dizzy or being in a spin. It is based on the classic game concept of matching up groups of coloured balls to make them burst; only instead of doing it in columns, the balls rotate freely around a pivot in the centre of the screen and expand outwards rather than upwards. The aim of the game is to clear all the balls in each level (15 total, by the way) by matching them up into groups of three or more of the same colour. However, by firing new balls at the structure in the centre you will cause it to pitch and rotate around the pivot they are attached to. The game ends when the structure in the middle gets so big that one of the balls attached to it touches the edges of the screen. The controls are very simple; use your mouse to move the little aiming arrow and then click the left mouse button to fire. You can switch between the two available queued up colours of balls by pressing the space bar, and you can swap back and forth as many times as you like before firing. Every time you fire a ball that ends up being added to the structure and doesn't actively clear any groups in the screen, that counts as one "miss". 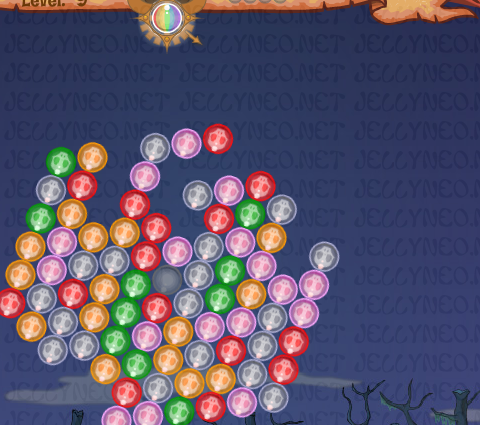 After you reach a certain number of misses, more balls will be added to the structure in the centre for you to clear. The number you are allowed to make differs into miss 5 times, after which an additional 5 balls are added to the screen; as you progress through the game though it gets more difficult, with balls being added after every four misses and then after every three, with the number of balls added steadily increasing as well. In order for it to be game over, one of the balls attached to the structure in the middle has to either touch one of the walls or cross over the banner part at the top of the screen. If a branch is getting close to this danger area, the game will helpfully let you know by making those bits flash red. However, even if you have a branch that is capable of crossing this invisible boundary, the game doesn't actually end until the offending part touches it. So theoretically speaking, providing you keep this part confined to a corner and don't accidentally spin it round, you can continue for a while until you get the colours you need to get rid of it. What would a game like this be without the odd power up to make life easier (or harder)? These are the regular Spinacles you'll be playing with. They come in a variety of colours and designs, but they all act the same way. Bombs will explode any balls in the immediate vicinity to them when they land. Perimeter power ups will remove all the balls around the outside edge of the structure, which can come in extremely handy in a tight spot. These give you a "free shot" in that if you use it and don't manage to clear any groups on that turn, it won't count towards your allowed misses. The colour of the outline and cross symbol will tell you what colour ball it will become once it lands. Rainbows are wildcards and can be used in place of any colour. They can be used to clear several different coloured groups at once. When you clear a group of balls, you will get 1 point for each of them. If you then go on to clear another group with your next shot, you will receive 2 points for each in that group. 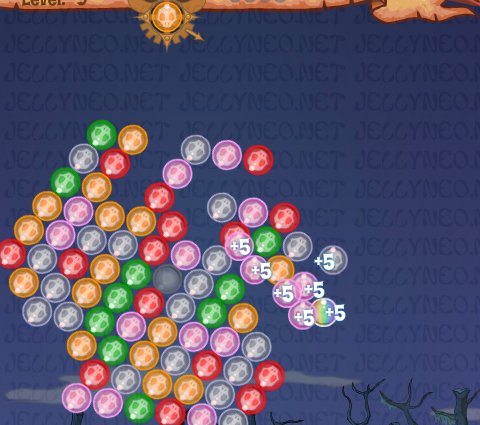 By linking together chains of clearances, you increase the number of points you get each time. Rainbows, Free Shots and Perimeter balls can all be used to either start or continue a combo, but Bombs can't. Although they can be useful, a Bomb will reset any combo you currently have going and any balls removed using one will only award you 1 point. You can ricochet balls off the walls to reach groups which are on the sides or at the bottom of the structure, although it can take a bit of practice to get the aim right. Bear in mind when you do this that, when the ball eventually makes contact with the structure, the fact it has bounced off the wall will affect how much it causes things to move. Using this method also makes it possible to hit the structure much lower down, causing it to rotate further so you can line up your next move. As mentioned earlier, Bombs can be as much of a nuisance as they can be a help. If you're in the middle of a combo, then you don't want to use a Bomb, because it will reset the scoring back to one point. Instead, just keep pressing the space bar to hold it back for as long as possible. Bombs can come in particularly handy when things start to get out of control a little, especially if you have one large offshoot reaching out towards the edge of the screen. In cases like this, it's best to aim for the thinnest part as dislodging balls here can cause the whole thing to become disconnected from the main pivot and get rid of the whole problem area. Bombs can also do a lot of damage if you can get them close to the central pivot, as blowing up the underlying balls in the structure can cause the whole thing to fall apart. Probably the easiest way to get points in Spinacles is by purposely missing when you're aiming balls at the middle during the first few levels. Since you start with so few and only a couple of colors, you can deliberately aim wrong to add to the collection of balls in the middle, thus allowing you to build up large combos for more points. As you get down to fewer numbers again, you can simply build back up and play through again until you get bored. It's an excellent strategy if you're looking for a trophy. If you manage to whittle things down to a few balls left in the middle and you get saddled with a colour that you can't use, you can shoot it against one of the walls so that it bounces around the screen and misses the middle. After a few laps it will disappear and, although it will still count as a "miss" in regards to not having cleared anything, it won't otherwise incur a penalty. However, sometimes you'll find that the central hub is too large to make the useless ball miss it as it bounces around the screen. In these situations, you can lay the aiming arrow horizontally across the top of the screen and fire at the wall; after a few bounces from side to side the ball will disappear. You can use any colours that you don't need to spin the structure one way or another to help you reach groups that you can get rid of. The pivot uses the laws of physics, so if you fire a ball at a bit near the bottom, it will cause the whole thing to rotate with more momentum than if you fired it at a part nearer to the top. Bear this in mind especially if you find yourself with a branch that is nearing the edge of the screen, so you don't overdo it. If you've ever played Neopets: The Darkest Faerie, the music in this game may ring a few bells. A very similar tune was used in Shadowglen Woods! Thank you princess_rozelia for pointing this out to us. I think I've said pretty much everything there is to say about this game now, proving that nothing is so simple that I can't make an essay out of it. :P Just remember to take breaks every now and then, as it is extremely addictive; if you end up seeing the game screen when you close your eyes, you know you've overdone it a bit. Have fun!